The most common type of filter is a rapid sand filter, which achieves filtration by moving water vertically through sand. Pressure filters and rapid gravity filters work similarly. With pressure filters, the filtering medium is enclosed in a steel vessel and the water is forced through under pressure. * Filter out much smaller particles than paper and sand filters. * Filter out virtually all particles larger than their specified pore sizes. * Thin filter membranes allow liquids to flow through fairly rapidly. * Strong construction can withstand pressure differences of typically 2–5 atmospheres. * They can be cleaned (back flushed) and reused. 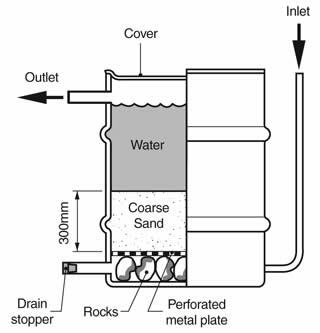 Slow sand filters may be used where there is sufficient land and space to accommodate this type of wastewater treatment. This is because the water must pass through the system slowly, as the name implies. Slow sand filters rely on biological treatment processes for their action rather than physical filtration. They are carefully constructed using layers of sand from the coarsest grade, along with some gravel, at the bottom, to the finest grade of sand at the top. Drains at the base convey treated water away for disinfection.